If the picture is not straight you will need to correctly define the angle of the image. Use the Crop tool to frame the outline of the face with the arrow pointing to the top of the head. 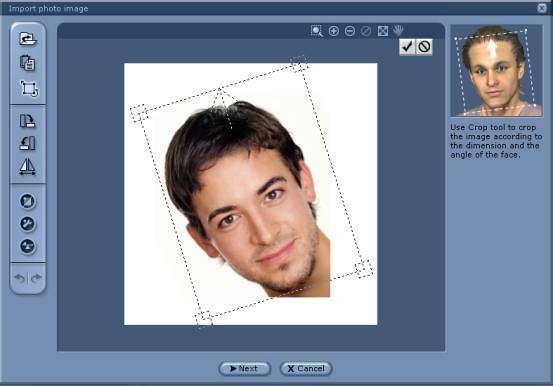 Draw the rectangle round the face and drag the corners with the mouse to rotate it. Use the guide in the upper right corner to see how to properly correct a tilted head. Each corner of the rectangle has a small square round it. Click in the square, inside the rectangle to resize the rectangle. Click the square outside the rectangle to rotate it. Click and drag inside the rectangle to move it. Click and drag outside the rectangle to redraw it. When your face is properly framed with the rectangle, click the check mark button. Click the abort button to abort. Use the buttons on top to zoom and move the image. Zooming during the fitting process is recommended to ensure a good fit for your facial image. Use the buttons on the left-side toolbars to rotate or flip the image, or adjust the color balance or contrast settings. For more details about photo adjustment, please see Photo enhancement. 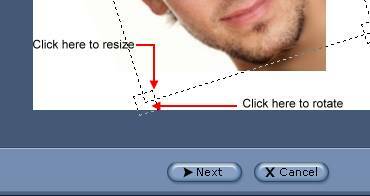 When your image is properly edited, click the next button to proceed to the next stage, setting the facial boundary.